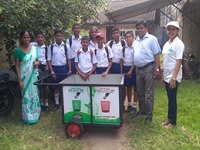 Promoting Integrated Community Driven Waste Free Green City in Galle. Galle City is a typical city in Sri Lanka, where environmental issues are becoming more prominent due to rapid urbanization. With the increase in population, 40-45 tons of rubbish are produced every day. As the city lacks sufficient land for proper landfills, therefore the rubbish is collected into a huge mountain. This has been polluting beaches, which are Galle’s most important tourist resource. To Given this background, Galle City aims to become a rubbish-free city by implementing community based solid waste management programs. 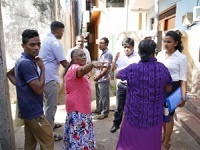 Galle City aims to become a rubbish free city through community based projects, changing the way people think and connecting local partners to increase collaboration. Awareness raising activities through educational seminars and posters for local residents. 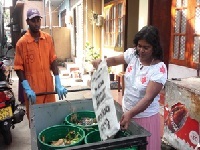 Rubbish collection and separation initiatives in pilot areas.